This issue of Newsmax magazine features one of the most penetrating looks into the private and public life of a leading American media icon, Sean Hannity. In a special May cover story, "A Great American: Inside the World of Sean Hannity," the Fox News star takes Newsmax readers on a rare and exclusive journey, recounting his incredible career rise from home contractor to one of the nation's most influential news personalities. He offers a touching personal account of his family's role in his success, and a behind-the-scenes view of hit cable show. Today Sean Hannity is the nation's leading conservative media titan with an awesome reach across three media platforms: television, radio, and Internet. Each night over 2.5 million viewers tune in to Fox's "Hannity" to watch the straight-shooting host eviscerate liberal talking heads and political correctness. His nationally syndicated radio show, broadcast from New York's powerhouse WABC, reaches an estimated 13.5 million listeners each week, putting Hannity just behind Rush Limbaugh in audience. His powerful message and broad reach have made Hannity the Obama administration's public enemy No. 1. 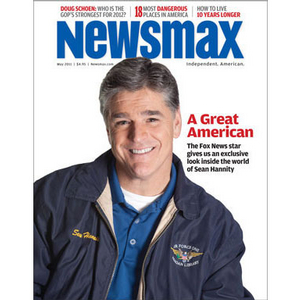 For the first time ever, Hannity shares with Newsmax readers his up-close and personal look at his faith, his family and his future, his thoughts on today's political scene, his take on the 2012 GOP presidential field, and more. Hannity on Trump: "I love his outspokenness." Hannity on Obama: "Jimmy Carter on steroids"
Taxes, spending — why Washington "shocks the conscience"
Doug Schoen: Who's the strongest GOP candidate for 2012? Honoring the speech that ended an "evil empire"
Should you insure your pet?